For sixty year old Konda Karamma of Markandi, life revolves around her house and the sea. Every morning she walks for more than 10 kms to collect fish from the sea and sell it in the market and the traders. This fetches her around. Her husband who was a fisherman drowned in the sea when he was on a fishing spree about four years back. Her sons –both school drop outs have migrated to the neighboring Andrapradesh, Mumbai and Kerala in search of jobs. “I have never gone outside Berhampur. Sometimes I ask my sons to take me with them so that I can see how the cities look like. Moreover I can get some good medicines for my backache there. They don’t have good medicines here,’ says Karamma who has been complaining of a terrible back pain for three years now. Saraswati,her daughter goes to the village school and is class 8. “I like to go to school but there are not many girls in my class. They are all getting married one by one and my mother too is looking for a groom for me. There is no use of studies for us as we cannot get office jobs in small villages. Moreover elders say that if girls study much, it will be difficult to find a groom for in our community.” Most families in the fishing settlements dotting the sea have been fighting poverty, unemployment, illiteracy and health issues everyday and have similar stories to tell. It has promoted a Self Help Group federation called “Divya Jyoti Mahila Vikash” which has been actively generating awareness on marine conservation and environment security to secure the livelihood security of this community. 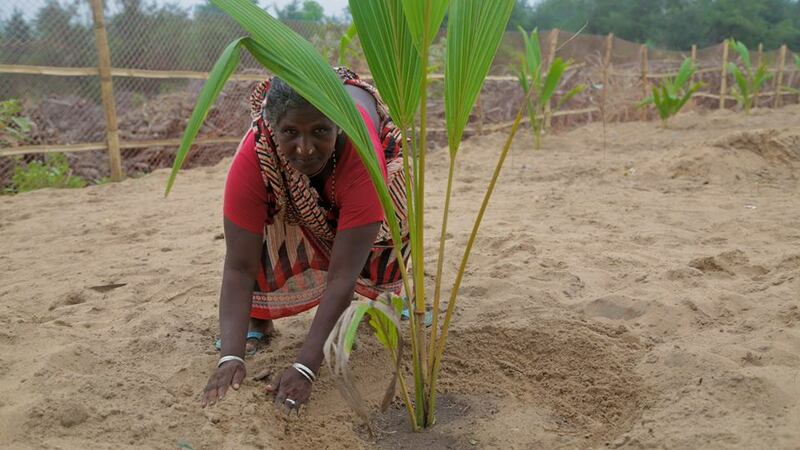 The women SHG federation is actively engaged in plantation of casuarinas trees to minimize the effects of disaster in marine coastal villages. Divya Jyoti Mahila Vikash has also been supporting, coconut plantation and kitchen gardens to promote secondary livelihoods among marine fishing communities in Coastal villages of Ganjam district.